When you publish your own book, you should have clearly defined goals. Maybe your ultimate goal is to become a bestselling author or maybe you want to reach a specific audience and change lives. Either way, learning that you have sold enough books to earn recognition is a surprising achievement and one to be very proud of. An easy guide book using a safer alternative, natural silica mineral, food grade insecticide. 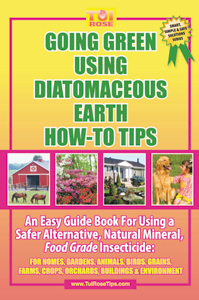 The first and ONLY informative guide for users of Food Grade Diatomaceous Earth (DE)! For better health, forget harmful chemicals by using instead Mother Nature’s gift, a fossilized algae mineral powder for a wide variety of purposes. Learn 101 ways to use DE as a home and garden insecticide; animal feed additive for anti-clumping and anti-parasitic; grain, nut and seed preserver; soil fertilizer and amender; deodorizer for kitty litter, refrigerator, shoes, vacuum bags, and barn manures; bird de-licer, kitchen cleaner scratch-free soft scrub, metal polisher; relieve itchy bug bites, and dry up oil leaks and spills and much more…. Tui Rose RN., as a concerned mother and registered nurse interested in healthy living, family and pet health, and environmental safety, could not find a book anywhere in the USA or western world on the far safer alternative Diatomaceous Earth(DE) for consumer usage as an alternative to toxic chemical insecticides. So Tui felt compelled to write a book herself on this topic to fill the literary void. What pleasantly surprised Tui was just how multi-faceted DE happens to be with its many uses other than as a safer natural insecticide. As Tui rubbed the powder dry between her fingers over a tarnished silver spoon, the black film almost instantly lifted to reveal a shine faster than any commercial silver polish could muster. When she wrote on a paper towel with a magic marker and the ink bled through onto the cream kitchen counter-top, DE came to her rescue as a light abrasive just like comet or ajax. Are you looking to publish your own book and receive support like this?